Cambria's from the Marble Collection in a spa-style bathroom. Photography courtesy of Cambria. Marble has been a staple of elegant homes and inspiring public structures since antiquity and with good reason. 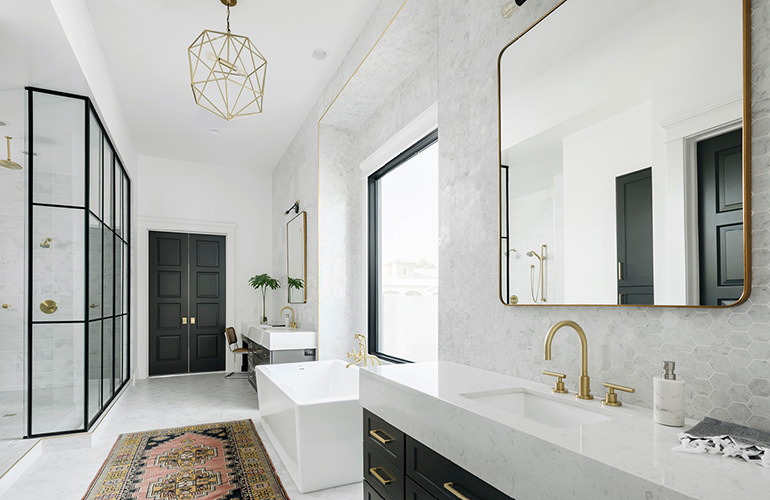 Marble can serve as a statement piece in a room and add touches of drama, or it can seamlessly blend in with other elements to create a space that feels light and airy. Designers and their clients are not immune to the popular stone’s charms even today, as evidenced by its recent boom in specification. But marble does come with some problems. It’s a weaker stone and highly porous, meaning an eagle-eye approach to maintenance is needed to keep it looking its best. Chemical sealants can only do so much to protect the color, and chips and scratches can happen with alarming ease. 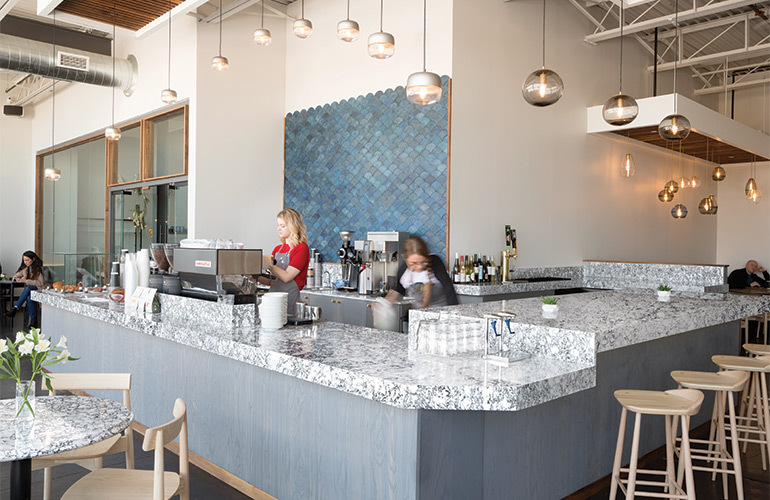 Minneapolis cafe Parallel uses Carmbria's at the coffee bar. Photography courtesy of Cambria. That's why is an ideal alternative that offers longer-lasting performance and a bevy of beautiful, inspired-by-marble looks. With advanced technology, Cambria manufactures their products with sustainably sourced, naturally clear quartz. This abundant material is significantly stronger than marble and requires the bare minimum of upkeep—warm water and clean cloth are all that is needed. Cambria's style perfectly fits this transitional kitchen. Photography courtesy of Cambria. The Marble Collection currently contains over 25 original designs, all named after different towns, castles, or rivers in Wales and the United Kingdom. Ten new designs have been released over the course of 2018, including the arresting black-and-white , the muscular , and the watery . These three designs in particular hint at an emerging trend in surfaces. Designers are welcome to explore the and learn more about of Cambria’s products for everything from residential kitchen and baths to commercial accent wall applications and even furniture. 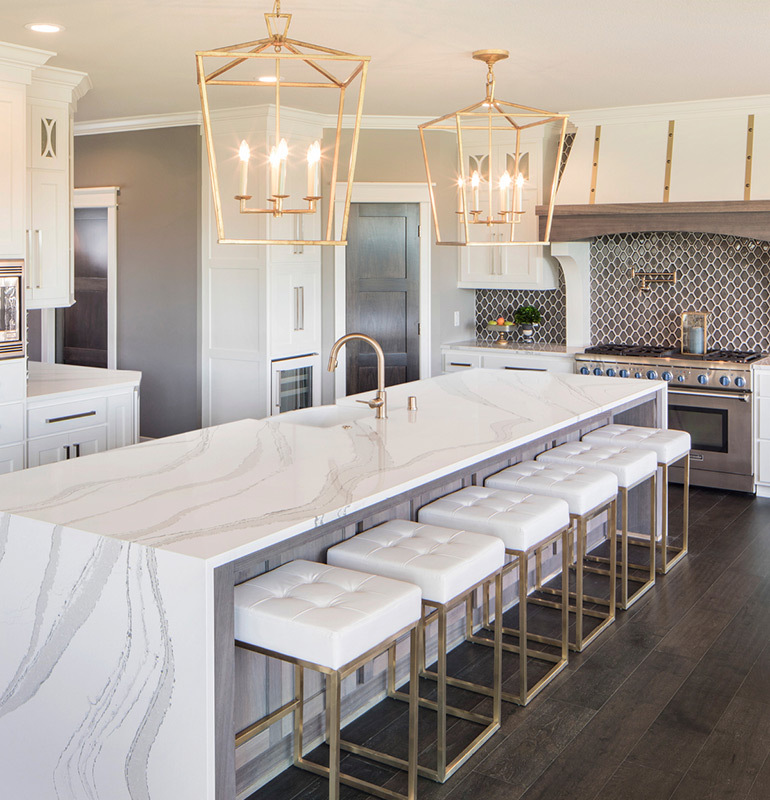 See more inspiration and learn about the advantages of Cambria on Cambria's new blog, .